Sojourney: As avid travelers, we look to travel for more than just the memories and experiences; we look to challenge ourselves, learn and grow, make new friends and meet new and exciting people, expand our perspectives, appreciate life, have an adventure, and escape our daily lives. Travel is the ideal place to test yourself. It pushes people to their limits and gets them outside their comfort zone. You'll discover how resourceful you are when you're exposed to new places, people and experiences - and how exciting it can be when everything is new and different. "The grass is always greener on the other side." You'll feel pride and happiness when you finish your trip successfully, so it can be really special to record where you've been with a Scratch off map. You'll feel more encouraged to make that next Journey with this map on your wall!! With the purchase of your Sojourney map, you will receive a gift ready tube, large 33¼ x 23½ inch map on silk paper, and an eraser. To ensure your map scratch off world poster looks beautiful when displayed, the eraser will help remove the left over debris when you scratch off a country. It's easy, it scratches just like a scratch off lottery ticket. Use a coin to scratch the area within the country you've made those memories! We've found it works best by doing long strokes with the coin - holding the coin at a slight angle. Purchase your Sojourney World Scratch off Map today, for that travel enthusiast that you know; before that summer trip around the world! A MEANINGFUL GIFT FOR TRAVELERS: To a traveler, it's very meaningful to see where they have been and to be able to physically have a map you can scratch off. It acts as a great reminder of the incredible experiences they've had. Our scratch off poster isn't a gift that people expect; it's a more creative and sentimental gift. Wait until you see their reaction! Our map comes gift ready in a tube! IMPROVED, UNIQUE & ARTISTIC SCRATCH FOIL: Our professional Cartographer designed the foil to resemble aged parchment paper ensuring that the scratch off map poster maintains a stylish vintage appearance both scratched and unscratched. The foil is even designed to include patterns of the earth's geographical landscape and terrain, so you can be sure that you're getting a higher level of craftsmanship in the foil design! 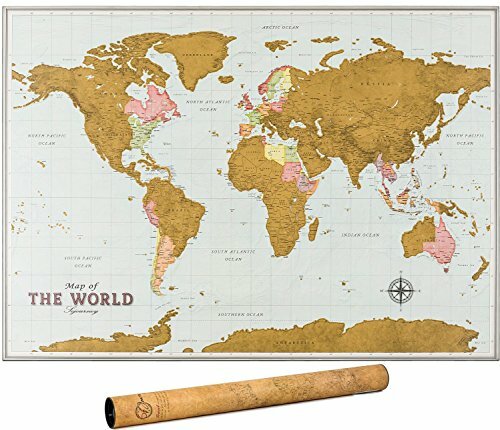 VINTAGE MAPS LOOK CLASSY DISPLAYED: Our XL scratch off world map has vintage inspired colors which are designed to contrast better with their surroundings as opposed to obnoxious bright colors used in other scratch-off map designs. The vintage style helps to provide a more subtle but classy look to any room; which only suggests to others that you're a host with good taste! STATES OUTLINED - USA / AUSTRALIA / CANADA: As travelers ourselves, we wanted to ensure your scratch off the world map also had all the individual states outlined before and after it's scratched. Planning that road trip around the United States for the Summer? We have you covered with all 50 states along with their major cities! 100 PERCENT MONEY BACK GUARANTEE: We're certain you're going to love our map scratch off poster! but we want to ensure you feel comfortable about it by offering you a risk free purchase. If you have any questions about this product by Sojourney, contact us by completing and submitting the form below. If you are looking for a specif part number, please include it with your message.